"The way Kedar and MS took responsibility was outstanding." It was not a happy beginning for India at home in 2019 as they lost the two-match T20I series to Australia 0-2, thanks to some incredible batting from Glenn Maxwell. However, Virat Kohli’s men made up for that disappointment by some margin in the first ODI in Hyderabad on Sunday by winning it by 6 wickets. This was India’s first win at home in the year and also the third on the trot against the Kangaroos who they beat 2-1 on their soil recently. Kedar Jadhav was adjudged the Man of the Match for his 1 wicket and unbeaten 81 runs in the game. After Australia captain Aaron Finch won the toss and elected to bat, the visitors scored 236 for 7 in 50 overs, thanks to opener Usman Khawaja’s 50; T20I series hero Maxwell’s 40 and 36 not out from wicket-keeper Alex Carey. Three Indian bowlers – Mohammed Shami, Jasprit Bumrah and Kuldeep Yadav took two wickets each while Jadhav took the other. India were off to a bad start as opener Shikhar Dhawan fell for a golden duck and after a 76-run partnership between Kohli (44) and Rohit Sharma (37), the hosts saw three quick wickets falling and they were four down even before reaching 100. It was then when Jadhav staged a brilliant turnaround with veteran wicket-keeper-batsman Mahendra Singh Dhoni who remained unbeaten on 59 off 72 deliveries. It was Dhoni’s fourth successive fifty against Australia in the ODIs this year after his heroics in Australia in January. The duo added an unbeaten 141 runs for the fifth wicket to take India home in the penultimate over and the hosts now lead 1-0 in the five-match series. 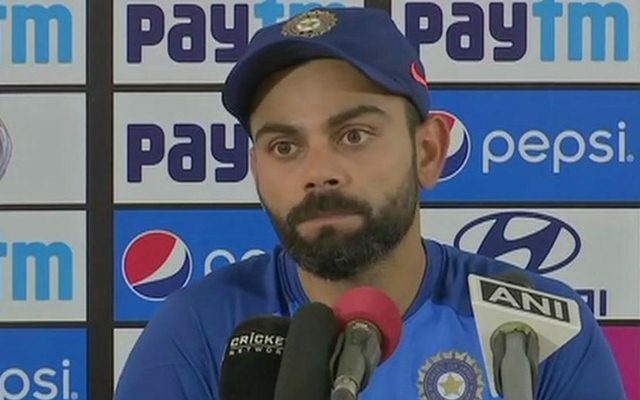 Kohli praised the two unbeaten batsmen for their show besides the bowlers. “It was a difficult game. The wicket didn’t offer as much as it did under the lights. I think the bowling (won the game for us) although we wanted to get a partnership going. The way Kedar and MS took responsibility was outstanding,” Kohli said in the post-match presentation. He lauded the efforts from Ravindra Jadeja (no wicket but only 33 runs in 10 overs), Kuldeep Yadav and Mohammed Shami for their performances in the game. The second match will be played in Nagpur on March 5.